The battles are over, Ser Ming Hui a.k.a Ah Fai is now legitimately the King of Speed City. It was a smooth sailing victory for Ah Fai and a complicated one for Tengku Djan. Djan had to complete additional runs due to “One More Time” while Ah Fai simply had to do allocated runs. 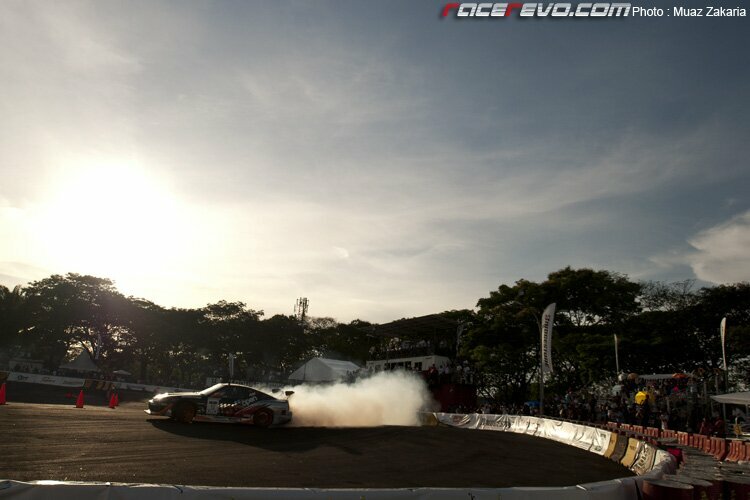 However it was the finest drift action as long as I can remember thanks to Tengku Djan’s more runs. The crowd and the media just loved it. Qualifying run in the morning session was a treat for the fans. Qualifying was actually scheduled to run on Saturday but due to some problems which I suspect too many cars unable to run in time, they shifted it on Sunday. Tony Angelo managed to get a new car and qualify after a huge crash on Saturday. He changed his machine from Silvia to AE86. The late qualifying is good in view of the fact that in Malaysia, typically fans only start to flock any event only on Sunday. That’s the trend here for those readers outside of Malaysia. In qualifying, local hero Tengku Djan Ley topped the qualifying with a 90+ score. Not a surprise since he is by far the best performing drifter in the competition. The familiar faces all qualified for the top 16. Djan, Tony Angelo, Hashiguti Anderson, Ariff Johanis, Loyai, Fazreen, Ivan Lau and Tan Tat Wei. The drivers then were presented to the crowd. Tony Angelo, founder of Drift Alliance compete in a less competitive machine. So it is hard to judge him based on this single event. The one thing that bugs me was all of the top international drifters were not using their race machine. Ryan gave a short driver’s briefing before the top 16 tandem battles. He stresses on what to do and what not to do in a tandem battle. Now on to the tandem battles, the first is Djan vs Michael Gan. It is quite peculiar to see Djan simply opened huge gap to his competitor effortlessly in the straight coming to the first turn. It must have been that Michael Gan’s car is relatively down on horsepower. The first tandem saw 2 times “One More Time” despite Djan dominating when he is in the lead. The OMT is due to several mistakes by Djan hitting those cones consistently when following the lead car. However in the end Djan prevailed. Ivan Lau takes the win from Johan Norman. Loyai dominates the battle of teammate. Azrina Jane gave all her best, but the old timer hangs on to victory quite comfortably. Tan Tat Wei shakes off Mervyn challenge. Mervyn did his best but TTW is not gonna disappoint his new team. Boy qualified for top 8 tandem, but he will meet Djan in the battle. Tony Angelo didn’t make the cut. Tony Angelo’s first tandem run saw him spun. His second got even worse, he crashed into the back of Ariff Johanis. It was a minor touch in the back, so Ariff could continue. Fazreen slammed the car into the barrier in a tandem with Hashiguti Anderson. Fortunately no one was hurt. The barrier had secured the impact. Ah Fai advances to top 8 after this intense battle. Stay tuned for the highlight of the Top 8 and the final battle. Coming soon. The above picture is a teaser for Part 2.